Lie down on side on mat or floor. 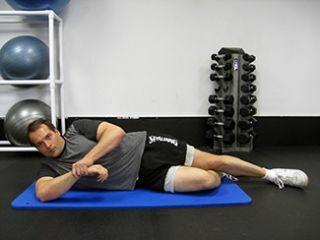 Position arm on floor with bent elbow positioned forward on mat and hand above elbow. With other hand, grasp back of wrist. Keeping elbow bend at a right angle, push forearm downward toward floor. Hold stretch. Repeat on opposite side.